The streets of 1893 New York City are bursting with life, while ominous threats lurk around every corner. For 13 year old Maks Geless, danger seems to follow him around. A thuggish gang, The Plug Uglies, constantly threaten the newsies, kids who sold newspapers, on their paper route. Saved by a strange girl with a stick, Maks barely manages to fend off the Uglies, although their leader seems to be planning something sinister. Meanwhile, Maks and the strange girl, Willa, are caught up in “misunderstanding” with Emma, Maks’ sister. She has been framed for stealing from the glamorous new Waldorf Hotel where she had been working. Maks and Willa must be trained by Bartleby Donck , a former detective, to prove Emma’s innocence. Does the Plug Uglies’ leader have anything to do with the incident? Above all, I enjoyed the plot. The young boy becomes a star detective to save his older sister. I enjoyed how their were two different character perspectives and how the two different parts of the story came together. I also enjoyed the characters. Maks is the determined young child who will travel to the ends of the earth to save his sister, Emma, while Willa makes you feel really sympathetic to her cause, when she reveals how she was left as a child and her mother died when she was very young. Bartleby Donck is an old detective who passes on the art of detection to Maks and Willa, as his life slowly ebbs away. 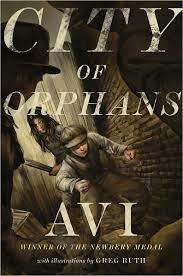 City of Orphans also has a moral to it’s story: to do the right thing and to fight for what you believe in. For example, Maks tried his hardest to free his sister, because he was sure she was innocent. He even completed his own crime scene investigation for evidence to prove that his sister didn’t commit a crime. If this book taught me one thing, it is to not stop fighting for a cause that is meaningful to you. All in all, I enjoyed this book. I would recommend this to just about anyone. This book can appeal to many different audiences, but it would especially appeal to anyone who likes a good historical fiction book.